Skating on the lakes started shortly after new year and the ice has just been getting thicker ever since. 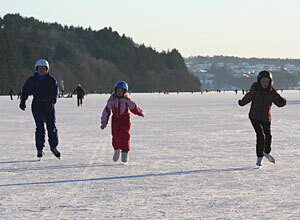 On Sunday 10th January Rogaland Skøytekrets organised a family day with medals for people skating around the lake - approximately 10 000 people came to Store Stokka that day, and thousands more to the other lakes in and around the town - Litle Stokka, Mosvatnet, Breivatnet and others. Some wind came along and blew away the snow off the surface, leaving huge expanses of ice to play on. If you ever wanted to get out and skate then this has been the time to do it. We can recommend that you dress up warm, wear a helmet, and have a go at playing ice hockey after you get past the initial wobbly stages - it improves your skill, at the expense of a few falls and bruises. We enjoy a game where you score by playing the puck (along the ice, not in the air) between the other players legs. Unfortunately though, it has been so cold that the expansion of the ice as the temperature varies has caused many cracks. There is no danger of falling through (the ice must be more than 30 cm thick now) but it is getting too easy to get skate blades stuck on cracks, with nasty falls. With luck, some rain is coming soon, followed by more cold weather, which will smooth off the lakes and make them ready for more fun. Remember - you should never go on a lake unless it has been declared to be safe - in towns this may be by a sign saying it is safe, or the signs saying it is not safe may be covered up. If in any doubt, ask locals and DO NOT go on the ice unless you are sure it is safe to do so. Well, the rain was quickly followed by snow - and more snow. The lakes have not been skated on since, but there have been cross-country ski trails across Store Stokka since the beginning of February. The pre-Christmas snow is STILL on many of the roads and footpaths in Stavanger (an embarrassment for somebody) like icy concrete, but at last it is beginning to melt. Time to get up to Sirdal if you want good winter conditions - it is sunny and around zero with well-groomed slopes there today.